.8x1.8" Designs, Logos, Numbers. New! Right and Left Clamp frames (PRCLP45LR) (Approx. 8" x 1.8") These frames allow you to embroider on shoes larger than a women’s size 10 and men’s size 8. Arm D is sold sperately. Owning Arm D is required before using this hoop set, because that hoop set includes the Machine's inserting clamp. Soccer Shoe Clamp is designed to allows embroidery on soccer shoe sides and tongues. Its exceptional grip strength will hold the shoe in place during embroidering. The clamp body is rail mounted , (it attaches to the drive rail of the panagraph) to ensure maximum rigidity on the machine. The window size is deep. The window size is designed small enough to fit down into most shoe sides and still have an adequate sewing field for logos, flags, initials, names, numbers etc. 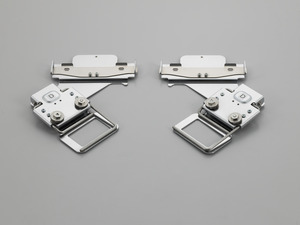 The upper and lower clamping frames have an aggressive non-slip surface to hold leather and nylon secure during sewing. Embroidery on finished shoe.